Boogie Cousins is back. It is scary, he looks really good for coming off an Achilles injury – although playing for the Warriors probably has something to do with it. 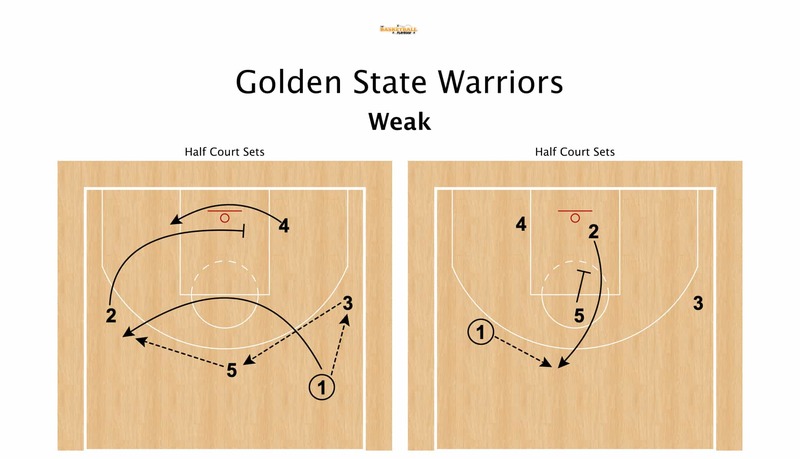 The Warriors are running sets for him to get paint touches and let him handle the ball, we will look at how they are using him in their offense and why it is bad news for the rest of the NBA. As the season goes along and Boogie becomes more comfortable I expect him to push the ball after rebounds it on the defensive end. Draymond is great at rebounding and starting the break, and I think Demarcus Cousins will eventually start to push the ball more and look for early attacks, handoffs and screens. This is a set the Warriors used to run for David West & Andrew Bogut – so it makes sense they will run it for Boogie as well. 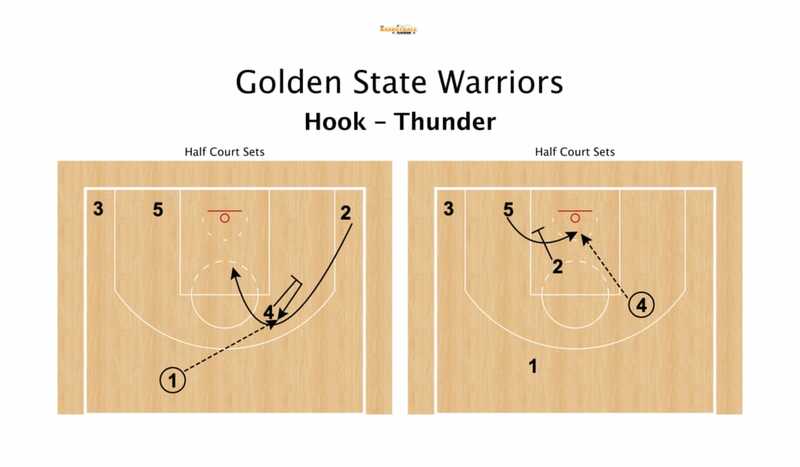 Starting off with a wide pindown for usually Steph or Klay (most of the time it is Klay) who then curls inside toward the paint, and the screener opens up at the elbow for a pass – this is “Hook” action. After the pass is made to the elbow, Klay will continue into the paint opposite and set a pindown screen for Demarcus Cousins to flash in the middle for a score or a deep paint touch. This is difficult to guard since the switch really isn’t plausible in the middle of the floor, and it is set so deep that Demarcus Cousins can get a deep paint touch. An action rather than a set, this could be potentially be a nightmare for opponents since they will use Steph and Klay as ballscreeners with Demarcus Cousins handling the ball. Since I expect him to be more comfortable bringing the ball up this makes more sense having Klay and Steph setting random ballscreens especially when denied. A set the Warriors are running for Demarcus Cousins is a slice screen into a post up. Most of the sets the Warriors will run for him will be sets they already used before for their bigs, and using Steph and Klay as screeners will not allow a team to switch the screen. This set is a ball reversal into a slice screen for Demarcus Cousins post up. I have included the video they ran for Andrew Bogut – this action starting in the 2015 playoffs, primarily looking for split cut actions off of it. A set that has been run by every team at almost every level is “Motion Weak” by the San Antonio Spurs. 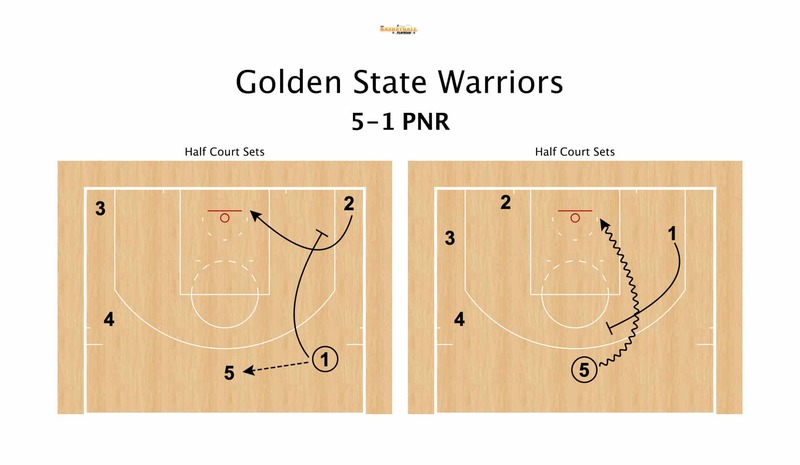 After the point guard passes to the wing he will cut through the lane to the opposite wing, and the ball gets reversed to him. During the point guard cutting through, the opposite wing will dive into the lane and set a cross screen for Demarcus Cousins to post up off of. This is by far the scariest thing about the Warriors adding Boogie Cousins. I understand the post ups, spacing and play creating that he allows, but running a post up with their center on the perimeter and executing split cuts is just stupid. Stupid in the way that makes no sense from a defensive standpoint and since it is random, incredibly hard to scout. Either running off a screen or slipping to the basket or even into the post after screening on the perimeter is one of the hardest things to guard. One of my favorite actions that involves Demarcus Cousins is how he will sprint up the floor and bury his man in the post. Looking to seal in the post and then get the ball on the block puts early pressure on the defense, then flowing into split cuts and actions off of it. Not a ton of new stuff for Demarcus Cousins, but simply plugging him into their old sets makes them so lethal and hard to guard. Once he gets into the flow of their offensive schemes, adding new actions and sets are going to make the Warriors basically impossible to guard. I hope you enjoyed this breakdown, and if you have any feedback or questions let me know!